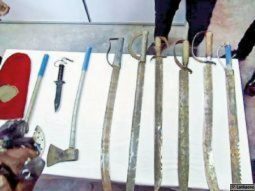 Jaffna News: Judge Jaffna court has sentenced a young man to six months imprisonment for allegedly covering a sword. . The court gave the verdict in the case of a police officer on a youth in Kopai. A sword has been found in the context of a temple in the Kopay area. The boy was taken by the boy. One of the neighbors who handed the boy's swirling scene in the handset gave it to Kopay police. The police went to the scene with the video and searched the boy with the sword. Another suspect in this situation was arrested by the police on the basis of suspicion. The sword was recovered from where he was shown. The suspect was arrested in Jaffna court. Last week, the trial against the suspect came to the court. When the suspect came to the spot, he took the sword in the temple area and took the charge.